Freedom struggle of our country, is probably the most inspiring one that you can find in the world's history, regardless of how diverse the culture of the country was, the how the whole country became united in fighting the colonisation and the exploitation of the colonial raj of east india company and the British empire and finally achieved independence on 15th August of 1947. The Indian national movement is perhaps one of the best examples of the creation of an extremely wide movement with a common aim in which diverse political and ideological currents could co-exist and work and simultaneously continued to contend for overall ideological and political hegemony over it. So many lives were sacrificed during the struggle and many men and women led the country during this struggle. Here are the 20 of the most notable women freedom fighters of the country, whom we should not only remember but learn from. Each time a women stands up for herself, she stands up for all women. In this day and age when women are struggling to find their space and freedom, they are forgetting the strength that they possess within. History has witnessed women who believed in their strengths and took the running of their kingdom in the same hands in which they wore delicate glass bangles. Women, who tend to leave an impression which cannot be affected by the powers of time. 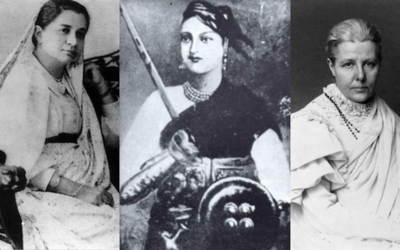 One such women was Manikarnika: The queen of Jhansi. They say rebellious is a path that everyone seeking for a change have to take, Manikarnika swore by it herself. Fondly known as Manu, her interest from the very beginning was amidst the grounds and horses. She was educated in a completely different domain compared to her fellow friends as well. Her expertise laid in shooting, horsemanship and fencing. At the tender age of 14 she was married to Raja Gangadhar Newalkar with whom she gave birth to a baby boy who died 4 months after. Devastated by this, Raja adopted a son who was Gangadhar Rao's son and renamed him Damodar Rao from Anand Rao. Lakshmibai has always been ahead of her time. At the age and time when having a boy to carry forward their heir by themselves mattered more than the mothers health, she became a women who went ahead to adopt somebody else's child and give him her own name. Soon after the kings death, the British India Company denied Damodar's acclaim of the throne and asked the Queen of Jhansi to leave her own kingdom at an annual cost of 60,000. There is no way that one can forget Lakshmibais famous phrase- Mein meri Jhansi nahi doongi (I will not surrender my Jhansi). It was exactly then that people saw the fire that was starting to burn in her. Soon after the Britishers declared the evacuation of the kingdom, she began to train both women and men to help her protect what was theirs. Right between all this the first ever world war broke down when Lakshmibai raised her own army. Britishers bombarded her fort but received a lo of firing from Lakshmibai herself. She gave in all that she could to protect what was her and what she believed in. Sarojini Naidu, a political activist, feminist and a poet was born on 13 February 1879. She was born in a Bengali Brahman family at Hyderabad. She was first educated at University of Madras and then at King's College, London and finally at Griton college, Cambridge. After completing her studies at the age of 19, she was married to Paidipati Govindarajulu Naidu and settled in Hyderabad. After the World war II, she supported various policies of the Congress party. Later on, she became the Governor of the United Provinces in 1947. And also, she was the first woman to become the president of the Indian National Congress after the Indian Independence. Sarojini Naidu was also an active writer who captivated the attention of many people through her poems. She took part in various lectures on social welfare, nationalism and women empowerment. She published her first volume of poetry The Golden Threshold in 1905 which was followed by many other literature works. She was also elected as a fellow of the Royal Society of Literature. Throughout the life, Naidu has been an active social activist. Annie Besant was a revolutionary, a writer, a socialist, and a womens rights activist. She was born in Britain in 1847, but was a supporter of Indian self-rule, going so far as to join the Indian National Congress. In her early days in Britain, Annie Besant grew to fame with the events of Bloody Sunday and London Matchgirls Strike of 1888. She was a woman who was not afraid of pursuing different school of thoughts and philosophy. Throughout her life she was friends with people with socialists, individualists, core-Marxists and many others including theosophists. Her work in India also started prominently with spiritual motives directed towards social welfare work and in 1898 she set up the Central Hindu College for the same. Her major political involvement in India started with the Home Rule Movement which coincided with the advent of First World War. As editor of the New India newspaper, Besant was vocal about the need of India for self-governance and freedom from the oppressive British rule. Echoing the slogans of Irish self-rule movement, she called the war Britains need and India's opportunity. The British government grew understandably uncomfortable with her when she founded the All India Home Rule League with Lokmanya Tilak, and in 1917 she was arrested for raising a red and green flag. This incident gained Besant immense support and popularity from the Indian populace and the British government was forced into releasing her and even into changing their narrative for their eventual aim for Indian governance. After the war a new leadership emerged in the Indian National Congress around Mahatma Gandhi, who had been among those who wrote to ask for her release, and Annie Besant withdrew more and more into her spiritual work. However, she still continued to advocate for India's independence, not only in India but even on her tours to Britain. The Central Hindu College that she had set up was included under the umbrella of Banaras Hindu University by her and Pandit Madan Mohan Malaviya's collaborative efforts. Annie Besant died in 1933, and she was survived by the imprint of those she inspired for the pursuit of freedom and philosophy. Not all revolutionaries carry swords, some carry pens, and ideas, and words, and they are nonetheless heroic for that. Bhikaiji Cama was one such figure of the Indian Independence moved who was born in Mumbai in 1861, travelled all over the western world while being vocal about her views on freedom of India from the imperialist rule, and died in 1936 after returning to her beloved country one last time. She worked with the prominent leaders of her time such as Dadabhai Naoroji, Vinayak Damodar Savarkar, and others in India and France. This duality of revolutionary thought, the ability or even the conscious choice, of being a liberal nationalist is of great relevance to us today. The life of Madam Bhikaji Cama is a lesson in history that patriotism need not be rabid or exclusive of other nationalities: she lived out of India for most of her life and was still of great help to those who were fighting on the lines for our freedom. We would do well indeed to remember Bhikaji Cama, and remember her well, for she was a proof that resistance is important, even in the bleakest of times. Umabai Kundapur is not a name that all of us might be familiar with and it's purely by choice. We come across very few people in life who are content to stay out of the spotlight yet do all the work from the sidelines. I daresay, that they are an almost extinct species. Umabai is an paragon of such virtue. Born in Mangalore in 1892 and married off in her pre teens, she faced a fate similar to thousands of girls during the days of British rule in India. What set her apart from the others was a burning desire to make a contribution to the freedom struggle irrespective of her gender and age. Encouraged by her husband and in-laws she pursued her education. Inspired by the great freedom fighters like Lokmanya Tilak who sacrificed their life for the betterment of the people, she joined her father-in-law to start a school for girls in Hubli. She became a volunteer for Congress and made it her life's goal to galvanize young women to join the freedom struggle. At a time when women were seldom seen outside their house, it was a very bold idea. She was progressive for her time and inspired many women to follow suit through her example. She believed that women had as much to offer as men and it was imperative to educate young girls to be independent. She was responsible for a camp that equipped young freedom fighters with the physical and mental strength needed for the future hardships that they would inevitably face. She continued to do her bit from behind the scenes never asking for recognition and fame even after India's liberation from the British. Refusing coveted posts in the government as was her due, she chose to continue her work for the upliftment of women. She lived a simple life and made an impact on countless other. Such is her legacy. People like her are rare gems and their shine will never tarnish. At that time the Indian independence movement was at its height and there were many nationalist Indians at Singapore working to bring about the revolution. Sehgal, the brave and indomitable woman she was, got involved with Indian National Army and joined the movement as a revolutionary. In 1943, Shubash Chandra Bose came to Singapore. Laxmi had heard that Bose wanted to recruit women for his organisation, so she took it upon herself to approach him. She managed to create an all women regiment, called 'Rani of Jhansi' Regiment with Bose. She recruited brave women into the cause and her title changed from Doctor and she became Captain Laxmi Sehgal. In 1944, Laxmi marched onto Burma with the INA, which had the support of the Japanese army. In 1945, as the war was all but lost for the Axis, the INA had to retreat. Captain Laxmi was captured by the the British Army in May 1945 and was imprisoned in Burma for almost a year, after which she was sent to India. Soon afterwards, the INA trials in Delhi increased public discontent and pretty soon the colonial rule was abolished. Afterwards she moved to Kanpur and set up a practice there. She aided refugees and marginalized people immensely as doctor and she kept on participating in moving the Indian Society forward her whole life until her death in 2012, when she was still helping patients in her practice. In today's world women empowerment and equality in general is a pretty hot topic. Humanity as a whole has come a long way towards the abolition of discrimination in the last few decades but there is still ways to go. When it comes to women activists and reformers in India, not many names are known to the general public and many worthy women haven't been given the due recognition that they deserve. One of such women is Savitribai Phule, who did immense work in the field of women empowerment, equality and education. Savitribai Phule was born to a farming family in Naigaon, Maharashtra in British ruled India of 1831. In those days, the outlook for a women's life wasn't great and she was married when she was just 9 years old to Jyotirao Phule, who was 12 years old at the time. Somehow the match came to be very beneficial for the general state of humanity at the time. Together the couple were extremely selfless and progressive and worked towards improving the society. At the time when educating the girl child wasn't heard of, she and her husband opened a school for children which provided education for everyone without any discrimination based on caste or gender, and she was just 17 years old at the time. Savitribai herself taught at the school, she is credited as being the first woman teacher in India. Savitribai Phule, herself was a writer and very talented at that too, she wrote many poems throughout her life. Even her poems taught against discrimination and promoted education for everyone. She and her husband opened 18 schools together. Such a selfless and noble person Savitri was, that she personally worked with patients of the bubonic plague which had broken out in the area in around 1897. While helping the patients she herself contracted the disease which led to her unfortunate demise. Savitribai Phule was an exemplary and inspiring human being and everyone should aspire to be like her for the betterment of the society.